at the races Ace Your Race with Rachel and Reid: pt II, Stride. 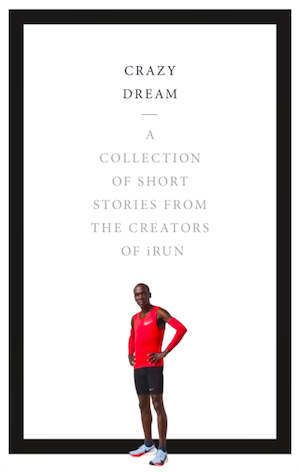 Between now and October 21, iRun is joining forces with New Balance and elite superhero marathon runners Reid Coolsaet and Rachel Hannah to help you run the race of your life. Each week, we’ll present a new instalment from either Hannah or Coolsaet about how to improve one aspect of your running life. But wait, it gets better! 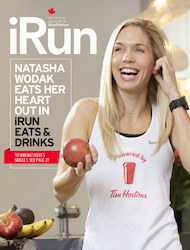 Because New Balance also sponsors Scotiabank Toronto Waterfront Marathon, where Coolsaet will be racing and where we’ll be making a special limited-edition race magazine after the race! Want us to profile you and your run? Simply tell us what you do in response to the phenomenon our race Gods are describing. Make sense? For instance, here’s Hannah on how to improve stride. What do you do? Let us know, and be included—picture and all—besides our cover stars. I try and lift my legs a bit higher at the end of a race. And I think about landing softer because it helps reduce the impact and force into the ground—and that helps reduce the load. The other thing, and I thought about this when I ran Boston, is you want higher cadence. Especially when you get tired. So practice, practice, practice, a recovery run is a great time to work on form—how many steps you take per minute. When I run, I try to lean forward and keep my head up. You want your chest open, it helps you breathe. I try and look forward, with a slight forward lean. I try (as best as I can) to find my comfortable arm swing. See, if you’re having trouble with your hips, your arms compensate by twisting—it comes from your lower body, what your arms are doing, especially on races with hills. A couple weeks back I ran the marathon distance in practice and, towards the end, I was leaning to one side, almost twisting my body because one of my hips was dropping. I was twisting my upper body to compensate. Any weakness in your body can lead to a breakdown in form. Especially when fatigue sets in. Luckily my coach noticed this breakdown in form at the end of my run. I told my Physiotherapist (Desmond Fung) and he gave me a few exercises to help strengthen my right glute/hip and core muscles to stabilize. It is very important to take the time to incorporate strengthening exercises that are specific to your individual needs as part of your training program. Back to hills and your racing: When you’re on the uphill part, think about your arm swing, swing them faster to get up the hill; keep them relaxed and fluid: motion is important. Any time you crunch or grimace it takes energy away—the more relaxed you feel, the better you run. Maybe it’s best to run with a smile. How do you run? What’s your form like? Let us know and be the second winner of our STWM New Balance contest and be profiled in our limited edition STWM magazine!